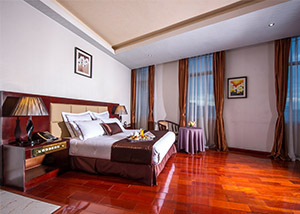 The Deluxe rooms are built in a modern thoughtswith city facing view in creating space, able to accommodate substantial furniture and decoration. The aesthetics are graceful and elegant. The experience is indulgent. It is available in Queen and Twin sized beds. Rooms are outfitted with every imaginable amenity to suite guest needs.